Make Mac computer compatible with the MXF video and audio from P2 card files. Convert P2 MXF files to QuickTime MOV, Apple InterMediate Codec for iMovie, Apple ProRes 422 and ProRes 4444 for Final Cut Pro X/7/6. If you are new to P2 card based camcorders, or you are using Panasonic HVX or HPX series like AG-HVX200 or AG-HPX170, you may find the saved files quite difficult get the P2 videos work on Mac directly and wonder the P2 workflow on Mac. If you got P2 files, but have no idea of how to deal with them on Mac, just keep reading. 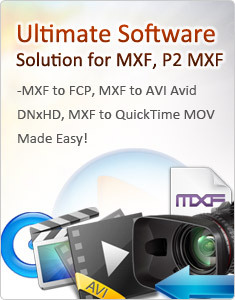 - Get to know about P2 files and MXF. - How to mount/transfer P2 cards on Mac? - What is the best MXF Converter for P2 files? - How to transcode MXF to Mac formats for QuickTime, iMovie, Final Cut Pro? - How to make P2 MXF smaller in size? Let's have a look at the P2 file folder structure on Mac. You would generally get a folder each time you press the record button on the camcorder. There is CONTENTS folder for each recording. The subfolders include AUDIO, CLIP, ICON, PROXY, VIDEO, VOICE. So you get .CIP, .SIF, .XML, .MXF files within the folders. The .CIP, .SIF, .XML files are related to .MXF files under the AUDIO and VIDEO folder. Some people may think the .XML file is the video file. 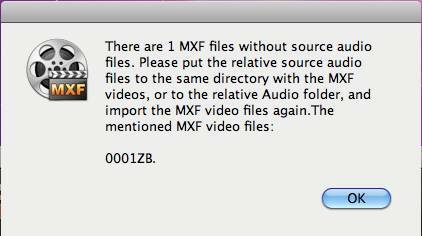 In fact, the .MXF files contain the video data and audio data under two separate folders. While storing/copying the files from P2 to Mac, we should keep the entire folder intact with the AUDIO folder and VIDEO folder. MXF, the short terms for Material eXchange Format, is file container for professional recordings. It is a media file standard for wrapping video or audio and associated metadata into a single container file. A number of video formats can be stored within MXF files. For example, a DV movie with compression like DVCPRO HD can be stored within an MXF file. Final Cut Pro works with QuickTime media files, so you need to convert MXF data to QuickTime before you can start editing. 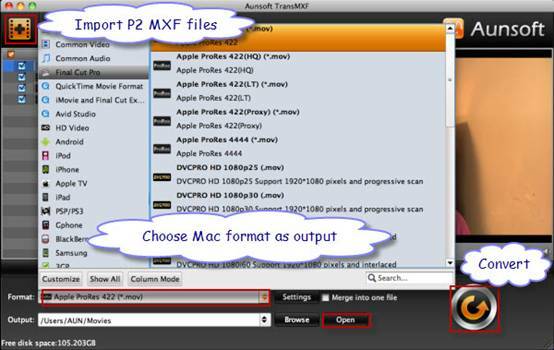 If you would like to convert P2 MXF to Mac format, Aunsoft TransMXF for Mac may help you finish perfect conversion of the P2 videos on Mac OS X. There are many ways to mount P2 card files on Mac, and here we list 2 methods: with P2 camcorder, or with P2 card reader. To transfer P2 files to Mac, you can drag/copy the whole card into a folder on Mac after the P2 card is mounted on Mac. Make sure the CONTENTS folder and the LAST CLIP.txt are copied. If the direct Finder copy does not work for you, or you get files glitched/ruined footage, you may use P2 content management software (P2CMS) to copy P2 files to Mac. While there are many converters claiming the support of MXF files, how to get the right one for conversion on Mac? Below are some factors for choosing the best MXF converter for P2 files. Some converters may crash or fail halfway, stop responding, or just take up to 2 days to convert large video. b. Make sure the video and audio are in sync. Even though some converters may seem to convert the P2 MXF files on Mac, you may finally figure out that the audio plays in correct/normal speed, and the video is double-speeded. Or the output is choppy. As you can see in the P2 file folder structure, MXF cameras record 1 video and 2 audio channels in three separate files, into separate audio and video directories. Aunsoft P2 converter for Mac can read and join these files on the fly, so that you get perfect video and audio from the P2 folder. If you lose certain audio for the video .MXF file, Aunsoft P2 converter for Mac will pop up with the warming to keep video and audio in sync. c. Leave original MXF files and folders intact. A good P2 MXF conversion tool shall keep the integrity of the original intact. However, some people may find the original files are changed to some extent. Aunsoft P2 file converter for Mac will keep your original files intact, so that you would not lose the original HD footage. d. Offer Mac related/compatible formats. The Apple Mac supports various formats and compressions like QuickTime MOV, MP4, Apple InterMediate Codec (AIC), Apple ProRes, etc. Apple ProRes is designed for smooth editing in Final Cut Pro 6/7/X, while AIC is for iMovie and Final Cut Express 4. To convert P2 MXF files to Mac video formats, Aunsoft TransMXF for Mac is the recommended App for you to keep the high quality and make P2 files Mac compatible. You can choose the format according to your final usage, like AIC for iMovie, Apple ProRes for FCP, and even QuickTime MOV for playback/preview on Mac. Step 1. Click the "Add Video" button to load the source .MXF files from video folder. Step 2. Click the Format option and choose output like Final Cut Pro > Apple ProRes 422, or iMovie and Final Cut Express > Apple InterMediate Codec, or Common Video > QuickTime MOV. Step 3. Click the "Convert" button to start converting P2 MXF files to Mac compatible format. Step 4. After conversion is done, click the "Open" button to get the output files. If you are a short documenter or would like to keep the recorded videos in small file size, you may also convert the P2 MXF files into H.264 MP4. If you are recording 1 mintue in full 1080P MXF, you will get almost 1 gigabyte on the P2 card. While converting to H.264 MP4 with Aunsoft TransMXF for Mac, you can keep quality with smaller file size. The conversion steps are similar to that for converting to Apple ProRes or AIC above. You just need to choose the format HD video > H.264 HD Video(*.mp4) as output.